Well I told you that I hadn’t forgotten Episode 17. Here is the podcast that I recorded on Tuesday 26th April, testing out some new recording software which I decided to turn into a radio show episode. Let me know what you think. Should I give this type of podcast a go, or is it a waste of time? If you enjoyed the podcast, please pop over to iTunes and rate it and leave a review. You can also do the same within Stitcher Radio if you use that service. It would help me out so much, and elevate the ratings so that others can find out about the podcast and learn about sustainable living in the ‘burbs. You can subscribe to the show via RSS or iTunes or Stitcher for your portable device. Just use the subscription buttons below. Until next time, stay green and keep keen! Today was a fantastic day to be out and about in the garden in my neck of the woods. With a sunny day and 23C, it was perfect to plant some onions and carrots. I prepared the garden bed by turning it over and raking it level. The crop beforehand was zucchini and cucumbers, so I usually follow those with a root crop, and this year I decided to plant out and entire bed with brown onions. We had a bumper crop of onions last year, and we finished the last one that was harvested in November just last week. So buoyed by last years success, it was time to get them in. I decided to purchase seedlings instead of growing my own. Kim helped out by taking the pictures for a bit of a ‘how to’. 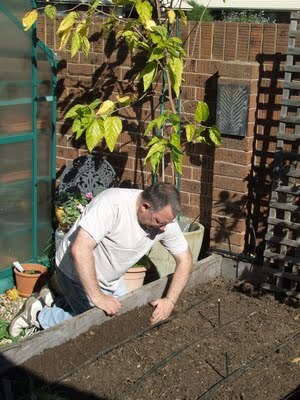 I learnt this technique from Peter Cundall, gardening guru. So this is how I planted them. Firstly, I dug a long furrow and piled the soil up on one side only. Then I divided up all the individual plants and placed them about 15cm apart laying on the non piled up side. Like thus, all the way to the end. Then all that was left to do is to backfill with the pile using the back of my hand. Don’t worry about the onions laying down, as they straighten up when they find their legs. There you go, one row down and three more to go. I won’t bore you with each row, but suffice to say that the procedure is exactly the same! 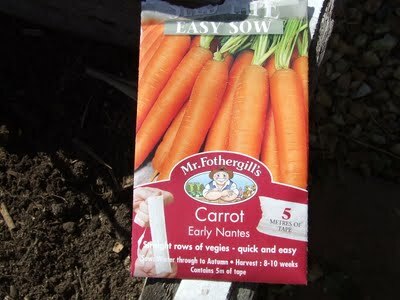 Then I got the urge to plant some carrots. Now onions are a great companion plant for carrots, as the onion smell deters carrot fly and aphids. 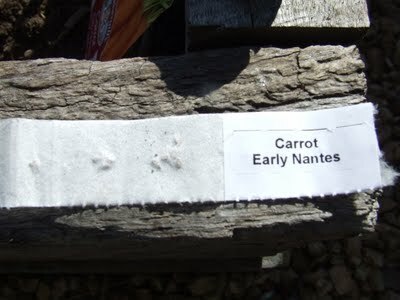 I was gifted a unique packet of carrot seeds yesterday for presenting a raised gardening bed workshop at our local Bunnings Warehouse. They also gave me some other stuff, but that is for another post if I get the photos sent through. Here is the seed packet. This is quite a cheats method of planting carrots, but it kind of guarantees success. As you can see, there are carrot seeds placed between two layers of tissue paper. I have read on some gardening blogs that you can do this yourself with toilet paper. 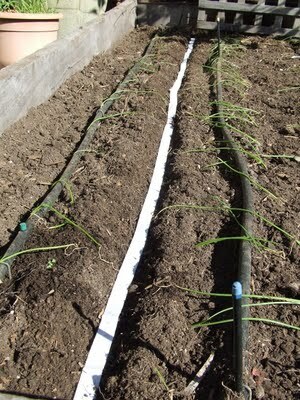 Then it is as simple as using your hand to make a very shallow furrow and laying the tape into it. The gently cover the tape to a depth of 5mm. 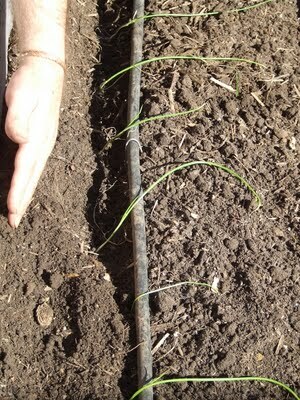 I planted two rows in between the outer rows of onions. 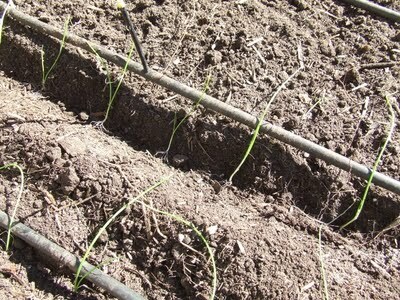 Now that all of these vegetables were sown and planted, I simply turned on the irrigation system and gave it a good soak. Once watered, I sprinkled some snail and slug pellets (iron chelate) around the bed, which is pet safe but lethal to the hordes of slugs I have around here after a wet winter. The carrots should be up in about 7-14 days, then about 3 weeks later I will have to thin them out. 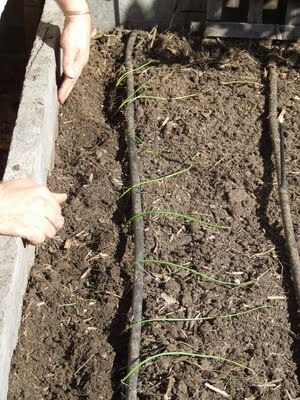 The onions will not need thinning as I have already spaced them out adequately for full growth. Other than planting, Kim and I trimmed our live Christmas tree, which was shading two of the solar panels, and significantly reducing their output. Then we had the pleasure of chasing the chooks around to give them their fortnightly leg oiling to keep away scaly leg mite. This time we both wore old aprons to stop the hens from splashing oil on us when we dunked their legs in the olive oil! All fun and games at the TGOG urban farm. 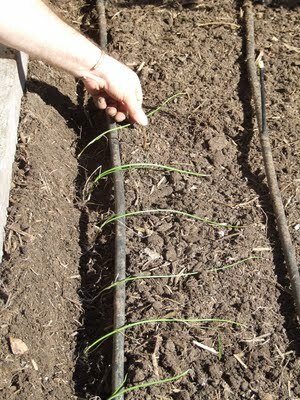 Have you planted onions and carrots before and what sort of success rate did you have? This weeks podcast is an interview with Julie Grundy, who lives in Perth, Western Australia and is the author of Go Greener Australia. I am a fan of her blog and also the G Magazine Challenges that she participates in. During the interview we talk about her motivation to continue writing, the water security issue in Perth, the proposed Kimberly Gas terminal, and her garden! It was a fun interview. And if you are wondering what happened to Episode 17, well it is going to be posted when I am in hospital. I recorded what I am calling a Green Easy Listening radio show using some new software, which Kim thinks may not be a hit, but I am willing to give any format a go to promote sustainable living. Watch for Episode 17 soon!